So yesterday I started a series of cake decorating classes by Wilton. Unfortunately in order to take the class that I really wanted to take, they are making me take the basic class :( Now if anyone has seen some of my cakes, I don't need to take the basic class but I figured I might as well since it is a prerequiste. So I get to class and there are about 6 other women in the class and none of them have any prior decorating experience. It was kind of fun to see the other women trying to figure out how to level a cake or put on a crumb coat. 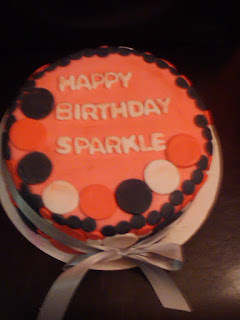 It took me back to when I made my first cake. Those days are long gone, but the teacher did manage to surprise with some new techniques. I also found out there is a cake decorating supply store in York that I didn't even know was there. So now I don't have to order so much stuff on the internet. The teacher also taught us how to make buttercream smooth like glass which I was always afraid (why I always use fondant)of using buttercream cause it can look bumpy if you don't know what you are doing.So now I am officially no longer afraid of using buttercream on the outside of my cakes! In other baking news, I am making a cake tomorrow for my aunt's best friend daughter who just came back from Afghanistan. It is going to be great! I am dying the cake turquoise and brown which are the colors she asked for. I am also putting some bows and other things on it. Pictures will be up tomorrow. BIG NEWS! I have to decided to become an event planner! It seemed to me like a natural progression from what I do now. Plus I will be able to offer my clients more: I can help them plan their wedding and make their cake. I will also be starting an email listing where I will place all of my new konfections and monthly specials. I also thinking about starting a monthly newsletter in which I will place all of this stuff in, but still thinking about it. I am starting to get more word of mouth business which is great! I LOVE IT! It's nice to see when what you put so much work into starts to blossom. God is mostly definitely good to me! Kima’s Konfections now offers special treats and cakes each month correlating with the months holiday or season. Each month an e-mail will be sent to you, to tell you about the monthly treat specials you can order. Pictures of each monthly treat will be posted to view and then order. By ordering the monthly treat specials you receive tasty treats at a discounted price. To order please call 862-215-2636 or e-mail at kima0920@gmail.com Please have all orders in by the posted due date. Delivery will be available in the Pennsylvania area and shipping for everywhere else. For any questions or if you would like to be on the Monthly Treat Special e-mail list please call 862-215-2636 or e-mail at kima0920@gmail.com. A Cake Tasting Party is a great way to receive that special cake for a discounted price. Your party can even get you a free cake! To book a party please call Hakima @ 862-215-2636 or e-mail at kima0920@gmail.com. I will need at least a 7 to 10 days notice before we can have your party. I also will want to go over flavors of cake, filling, frosting, and other treats according to your palate a week before your party. I try to have 3 to 5 cakes, fillings, and frostings to taste. When you book a party, you will receive a free Mini Cake or 10% off a specialty cake of your choice and design. You also will receive 5% off for every $50.00 in paid orders for your specialty cake. I do ask your guests to pay their orders in-full. I do this to ensure that you can receive your full discount on your cake. Also you have one week after your party for your guests to place cake orders at the discounted price. Enough cake orders can add up to a free specialty cake for you! Mini cake prices will depend on how much cake and materials are used. Only specific designs are available for cake party prices. Other cake designs will need a consultation. All cakes and cupcakes come with butter cream or cream cheese frosting. Decorations are simple roses, flowers and borders. Price may be increased depending on design. 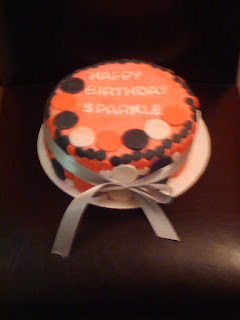 Fondant may be added for $5.00 a single tier and $10.00 for a two tier cake. This price includes fondant decorations. Price may be increased depending on the design of the cake. Fondant may be added to cupcakes for $2.00 a dozen. Price may be increased depending on the design. All cakes must be paid in full by check or cash. All cake orders must be ordered and paid for with in one week of the cake party. Wedding cakes, larger round and square cakes are not available at listed prices. Hello once again. So I had a customer order a birthday cake for herself about a week and half ago. I shipped it out yesterday. I think it came out cute though there was some things I wanted to change about it but didn't have the time. The cake was yellow cake with Vanilla Bean Buttercream with strawberry and banana filling. I thought it was a nice pairing and my client loved it! I am confident that she will be a repeat customer. It was a modern design of circles in pink, black and white. Below is a picture of it. I also signed up for more cake decorating classes this week so I can get better and learn new techniques. In order to stay on top of your game, you have to constantly learn new things to be able to compete with the other cake decorators out there. I also made a brownie cake today for my husband's co-workers. I always use them as sounding board for new ideas and projects. So it is a brownie cake covered in chocolate buttercream and surrounded by chocolate creme wafer and milk chocolate shavings. I call it Brownie Chocolate Paradise Cake because anyone who loves chocolate will love this cake. I am working on making my boards better for cakes like this. I am want to be unique in what I offer so I think I am going to work on more cakes like this. 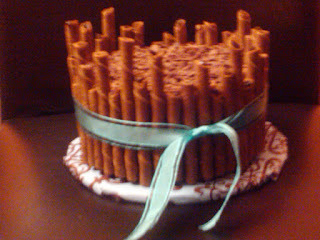 I also I like the way chocolate cigarellos look on a cake so I will be learning how to make those as well. I also saw on an UK website ( they offer some of the best stuff, but its so damn expensive!) chocolate roses made from modeling chocolate so I will be learning how to make those as well. On to baby woos. Today with Jayden was a good day until it is time for him to go to bed. Now my husband works during the day so he doesn't get a chance to see him until he gets home from work, sometimes later if he has something to do after work. So I encourage him to interact with him as much as possible in order to make their bond stronger because right now Jayden likes to cling to me. So I gave Jayden to my husband after dinner to put him to sleep so I can get some school work done and work on my newest creation (see above). Well Jayden didn't want none of it, he cried and screamed until I picked him back up. He then calmed down so I tried to give him back to my husband, the kid did the same thing again! Now my husband already feels some type of way because of the way Jayden acts towards him sometimes, this newest episode doesn't help. I ended up having to take Jayden back and putting him in the sling to get anything done. I don't know what to do, I think I will just have to keep at it by handing him over when my husband comes home and try not to get involved. I think that is the only way things will get better between the two of them. Are Bridal Show Really Worth It?? So today I decided that in order to generate more business, maybe I should go to some bridal shows to show some display cakes and samples. So I decided to start internet searching for local bridal shows in the area which were plenty. The problem was that for a vendor, it can be very expensive to go to one. Like a few I saw where $500 just for a table and chairs. WTF?! I very quickly realized that I won't be able to do as many as I would like, rather I might be able to attend one or two this year because finances. :( I have also decided to send my business card and a photo montage of my work to some bridal boutiques and other vendors to drum up business. Also I finished a birthday cake today for a client- Yellow cake with Vanilla Buttecream Frosting with Strawberry and Banana Filling. I come to realize that I don't like doing fruit fillings because they can make the cake uneven. On a brighter note... I have signed up for more decorating classes to get even better! http://kimakonfections.com/photos.htmlOkay. I have come to realize that when you have a child, there are enough hours in the day to do everything you need to get done. Like now, I am blogging at 12:30am because Jayden is finally sleep. And once again he is sleeping on my chest...sigh. So yeah not enough hours in the day, I needed to get my mid-term done today for class but guess what it didn't get finished because Jayden decides he wants to be extra fussy today and my husband slept most of the day because he works overnight on the weekends. So I have to try and finish it tomorrow though it will be late. I also had a cake to do today for a client, only the baking part got done today. The rest will have to be done in the morning because Jayden didn't want to sleep at his normal time, he wanted to stay up with mommy. I have to get a handle on this kid's schedule because if I am ever to do this full time, I need him to be on the same page as me. The one good thing today was that there was some batter left over so of course I made some mini cupcakes! I just love making cupcakes. 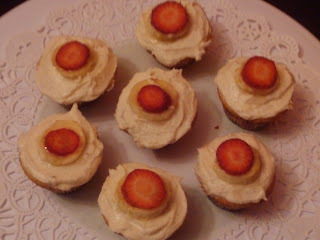 These were Yellow cake mini cupcakes with Vanilla Bean Buttercream Frosting. The buttercream came out great, it was a new recipe that I tried with real vanilla beans. It looked like smooth ice cream when I was done. So exciting! So this is my post! I decided to start a blog because as a new mom and an aspiring baker I thought it would be nice to share my story. I know there are plenty of blogs out there and I do follow some, but there is only one that I have come across that has detailed how hard it is get into this business. I also thought it would be neat to chronicle my life as a first time mom. So let's start with the later first, my son's name is Jayden Makai and he is 8 weeks old. He was born November 6th, 2009. I love him to death, but it can be very trying at times. Right now it’s the whole putting him to sleep and getting him to sleep on his own without mommy and daddy. We start by holding him until he falls asleep, usually on my chest, and then I try to move him to his play pen because he won't sleep in his bassinet. That thing was such a waste of money. The play pen (it has a sleeping compartment in it) worked for a little while and now he cries about ten minutes after I lay him down in there. So for now to get any type of sleep he ends up in the bed with us. Now I know plenty of people and doctors say don't have your baby sleep in the bed with you, but for us right now it works. He sleeps most of the night which is miracle for a child his age, so something is working. He sleeps on my side so I don't have to worry about his father rolling over on him, though I don't think that will happen, and I know that he is breathing okay. I am so paranoid about SIDS especially since he is sooo young. But now I think he is too comfortable sleeping in the bed and now I don't know what to do to get him to transition to his play pen or cradle when we get one. I bought a sleep positioner and when he sleeps and stays sleep on it, it is great but he doesn't do that often. So I have placed it in the bed and trying to get him to sleep on it in the bed that way I can move it out of the bed and into the play pen hoping that will work. We shall see what happens.